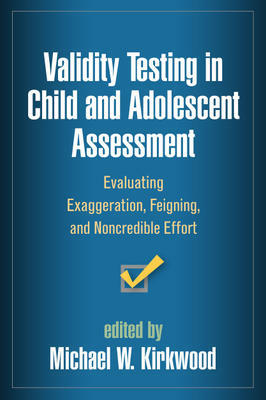 Thoroughly covering the "why" and "how" of validity testing with children and adolescents, this book is edited and written by leaders in the field. Feigning or noncredible effort during psychological and neuropsychological assessments can have considerable repercussions for diagnosis, treatment, and use of resources. Practical guidance is provided for detecting and managing noncredible responding, including vivid case material. The reasons that children may feign during testing are also explored. Along with information relevant to all assessment settings, the book features specific chapters on educational, medical, sport-related, forensic, and Social Security Disability contexts. Michael W. Kirkwood, PhD, ABPP-CN, is Associate Clinical Professor in the Department of Physical Medicine and Rehabilitation at the University of Colorado School of Medicine. He is also Director of the Psychology/Neuropsychology Program in the Department of Rehabilitation Medicine at Children’s Hospital Colorado, and founder and Codirector of the hospital’s Concussion Program. Dr. Kirkwood is board certified in Clinical Neuropsychology and board certified as a subspecialist in Pediatric Neuropsychology by the American Board of Professional Psychology, and has served on multiple boards of directors and expert committees. He has conducted extensive research on traumatic brain injury and pediatric validity testing in children and teens, has lectured widely, and has published more than 50 journal articles and 10 book chapters. He is coeditor of the book Mild Traumatic Brain Injury in Children and Adolescents.